Animal Wildlife | Pool Frog | The pool frog (also known as the northern pool frog) is a species of medium-sized frog natively found in parts of northern Europe. 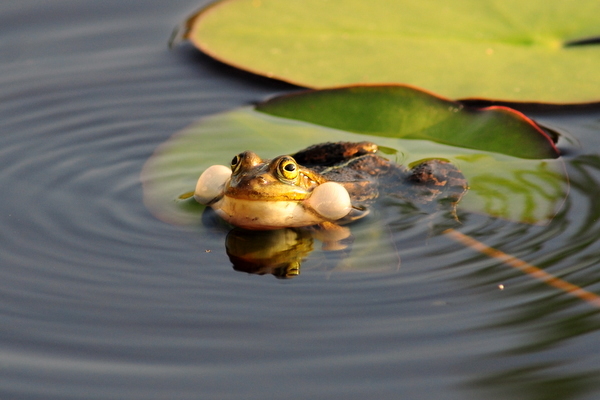 The pool frog is the rarest amphibian in England and actually is thought to have been extinct in native environment during the 1990s, but re-introduction programmes are now under-way. The northern pool frog is naturally found in Sweden, Norway and on Britain's south-east coast where it inhabits natural ponds found in forested or heathland areas. 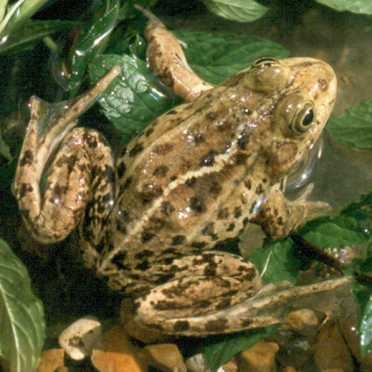 Much of the pool frog's native habitat has now been bulldozed to create housing estates which led to the sharp decline and extinction of this species on the British Isles. The pool frog is a medium sized frog that is generally brown or brownish-green in colour with a splattering of dark spots across it's skin. Pool frogs are also easily identified by their sharply pointed heads and by the two, lightly coloured stripes that run down either side of the pool frog's back. Frogs are well known for their webbed feet, and the pool frog is no exception. Pool frogs have webbing (flaps of skin) between their toes which not only assists the pool frog when swimming about in the water but also gives these rare amphibians more grip when climbing about on the slippery banks of the pond. 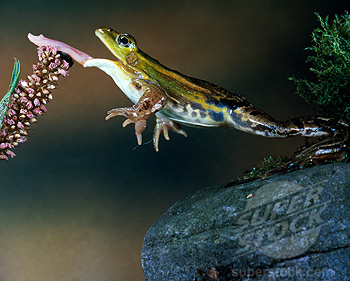 Like other frog species, pool frogs are carnivorous animals, surviving on a diet that consists only of other animals. The pool frog eat a wide variety of invertebrates including insects, worms and spiders which they catch using their long sticky tongue, after having watching their dinner patiently for some time. 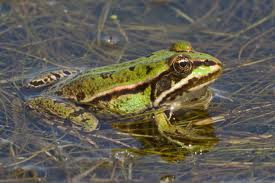 Due to their large size and semi-aquatic lifestyle, there are numerous different animals which prey on pool frogs in their natural environment. Birds and small mammals are the most common predators of the pool frog, along with foxes, cats, dogs and even larger birds of prey. Female pool frogs spawn (lay hundreds of eggs) in the warmer spring months, which float on the surface of the water in a sticky clump. When they hatch, the pool frog tadpoles drop into the water where they continue to develop, eventually losing their tails and growing legs enabling them to hop in and out of the water. Today, the pool frog is one of the rarest animals in the UK with the last remaining natural population thought to have disappeared from East Anglia in 1995. Extensive re-introduction programmes are under-way in undisclosed locations across the country to try and bring back one of our rarest predators. 0 Response to "Pool Frog"